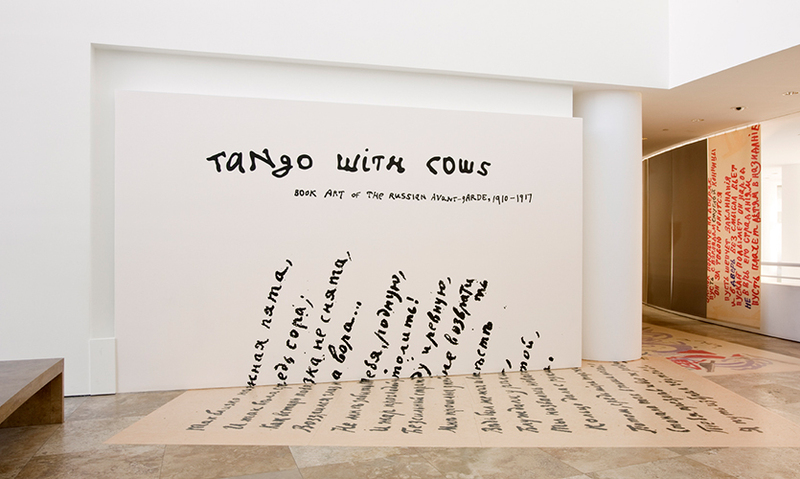 Tango with Cows: Book Art of the Avant-garde explored the way Russian avant-garde poets and artists responded to the crisis of the failed 1905 revolution, the famines of 1911, the rapid influx of new technologies, and the outbreak of World War I through their book art. Often working collaboratively, poets and artists designed pages in which rubber-stamped zaum or “transrational” poetry shared space with archaic and modern scripts, as well as with primitive and abstract imagery. The Russian avant-garde used these verbal and visual descriptions to convey humor, parody, and ambivalence about Russia’s past, present, and future. 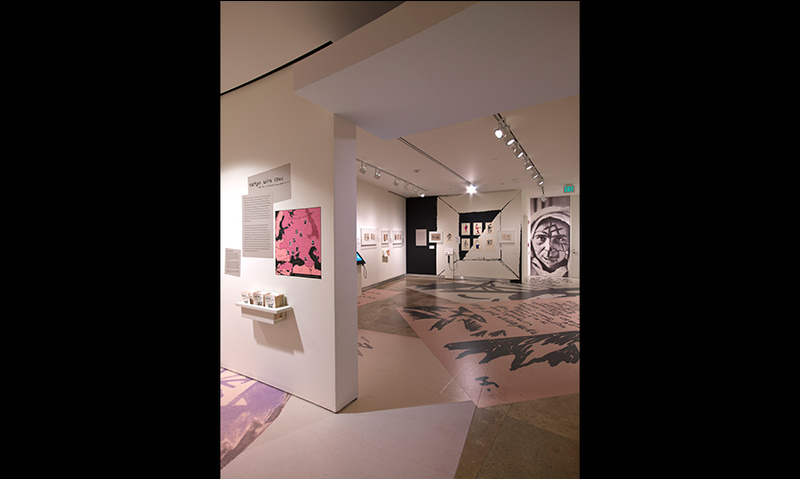 Getty’s in-house exhibition design team used the poetry’s signature rubber-stamped appearance as the visual springboard for the exhibition’s graphic identity. 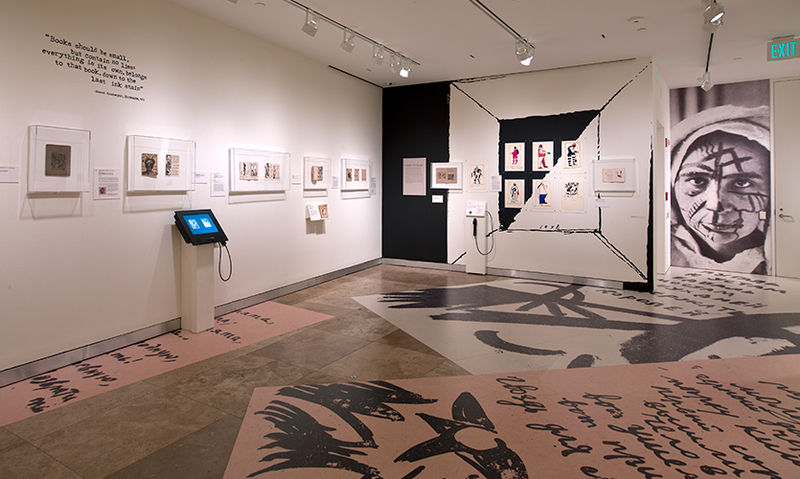 The exhibition title used for all promotional material and for the gallery title wall was manually typeset with rubber stamps. Inside the gallery, all section titling and wall quotes were created using this same technique. 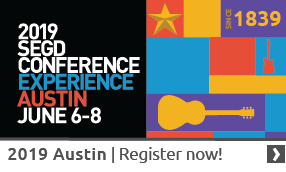 From the outset, the Getty curatorial and design team determined that the art would speak for itself, both literally (via seven listening and interactive stations) and figuratively (by keeping the design of the exhibition and promotional materials clean and unobtrusive). 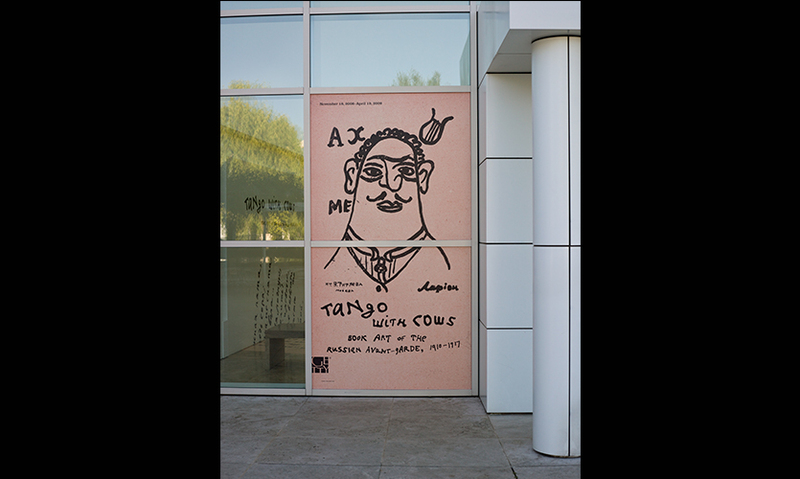 For the promotional banners, the Getty design team used the character of Akmet from Worldbackwords, whose strength of line and simplicity of application were the perfect image to combine with the title Tango with Cows and to convey the nature of the artworks’ absurdist humor. For the gallery design, it was important not to overshadow the books while at the same time quickly conveying the sense of transitional upheaval that is the essence of the poetry. The title wall was purposely kept simple and text based, but was activated by applying poem text to the floor and wall seamlessly. Gallery walls were painted white so the books would stand out, and the books were displayed in wall-hung shadowboxes that allowed visitors to get close. 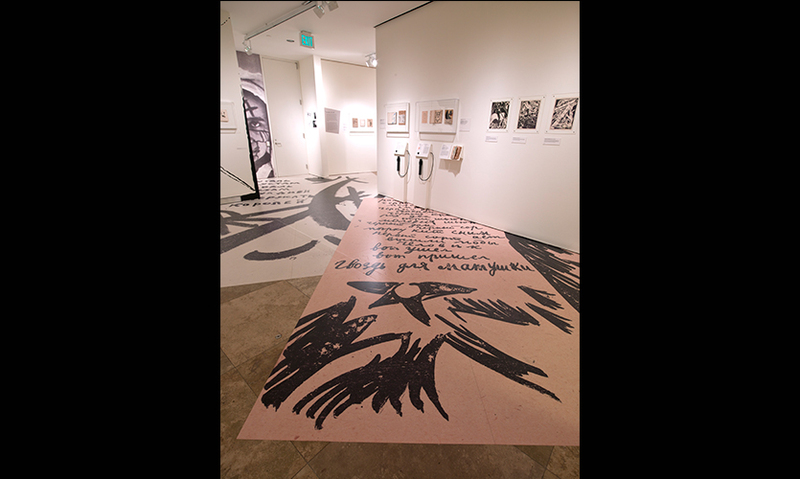 The gallery floor was completely open, providing a canvas for book images reproduced at over 22 ft. (using a 3M film that would not damage the existing travertine floor). A careful combination of handwritten poetry and illustrated pages enhanced the discordant nature of the experience. 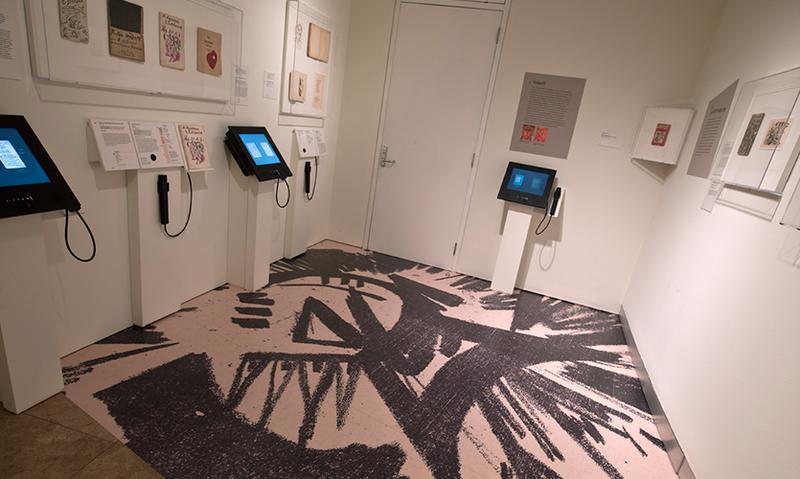 Floor graphics were also used to direct visitors from the title wall to the gallery entrance around the corner. To give graphic context to a display of costume designs from the opera Victory over the Sun, one of Kazimir Malevich’s original set designs was handpainted on the wall. 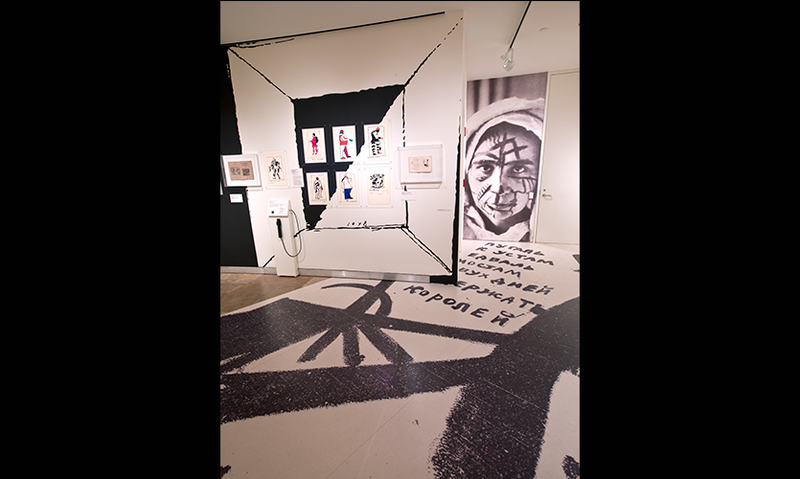 In conjunction with a photomural depicting an artist’s painted face and the floor graphics, this wall treatment gave visitors a sense of the Russian avant-garde without compromising the art’s presence on the wall.